The hedgehog and the porcupine are two distinct species. The confusion between the two creatures seems to stem from both animals' rather prickly exteriors. However, the animals are not closely related to each other, and differ widely in a number of respects. The easiest way to distinguish the two animals is by sight. Hedgehogs are much smaller than porcupines, ranging in length from 5 to 12 inches and weighing between less than 1 and 2.5 pounds. Porcupines are over twice that size, growing 25 to 36 inches long and weighing between 12 to 35 pounds. Hedgehogs have small, triangular faces and petite feet with tiny articulated toes and claws. A porcupine will have a round face, with broad paw-like feet and long, protruding claws it uses to climb trees. Beyond appearance, another main difference between hedgehogs and porcupines is where, and how, they live. Hedgehogs can be found across Europe, Asia and Africa. They are solitary animals, hibernate in winter, and make their homes in dry spots under hedges or bushes, rocks or buildings. Porcupines reside in North and South America, as well as Africa, Europe and Asia. They inhabit a variety of landscapes, from forests and grasslands to desert. Although their spiny coverings may be the reason these animals are often thought to be related, both creatures use their coverings in different ways. The hedgehog is covered by short, thick spines which are permanently attached to its skin. These spines usually lie flat and harmless -- so much so that it is possible to pet a hedgehog. 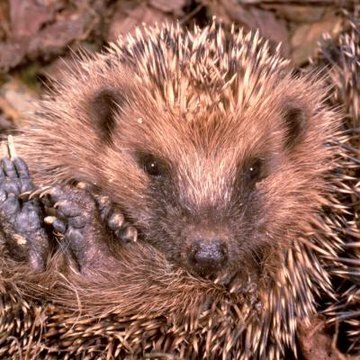 When threatened, hedgehogs will roll into a tight ball so their spines protrude and their hands, feet and faces are tucked away. Porcupines are more aggressive about using their prickly exteriors for protection. Instead of spines, these animals are covered with long, hollow quills. The quills lie flat when dormant, but will raise into a protective posture when threatened. If a predator gets too close, the quills will dislodge off the porcupine and stick into the offending animal. Porcupine quills have very sharp tips and are covered in barbs to make them painful and difficult to remove from an animal's skin. After an encounter, the porcupine simply grows new quills. National Library Board of Singapore: What's the Difference Between a Hedgehog and a Porcupine? How Do Animals in the Rainforest Hide From Their Predators? Do Hedgehogs Have Spikes When They're Born?